Aside from being a great workwear piece for the colder months, a cardigan is also the perfect way to add a layer and give your look a stylish update. A cardigan can be worn in a variety of different ways and there is one out there for everyone. You just need to find the style that suits you. Here are just some of the ways that you can style your cardigan depending on your style personality. If you’re a ‘Diva’, make an impact with a large belt, knee-high boots and bold accessories. ‘Classics’ look best with an effortless and uncluttered outfit. This elegant long line in a neutral colour is perfect for this particular personality profile. ‘Huntswomen’ need classic styles with natural colours. Push the sleeves up to add some structure. 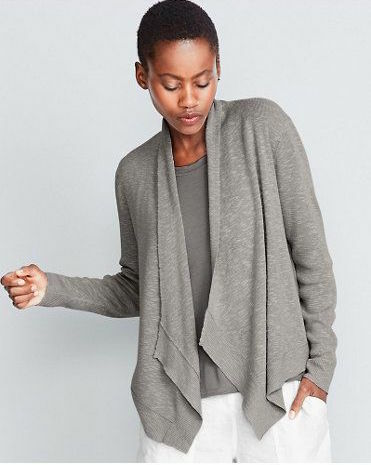 Keep it cute but neat with a smaller scale cardigan. A cropped or boxy style are great options for the ‘Gamines’. A neat shape is perfect for the ‘Princess’. Adding feminine detailing such buttons or a peplum hem will emphasis the ingénue and pretty features of this style personality. A waterfall or drape style with swing are flattering options for the regal, feminine and glamorous ‘Romantics’. ‘Bohemians’ can really have fun with a cardigan! Arty, funky and glamorous knits will reflect their personality. Like the ‘Bohemian’ and the ‘Adventurer’, the ‘Gypsy’ can go for chunky and natural knits, however don’t forget to add bold and extravagant accessories for a touch of glamour. The outdoorsy wholesome ‘Adventurers’ should opt for fluid or soft, chunky knits. Keep accessories and make-up to the minimum. At Red Leopard we look at all aspects of your wardrobe and style. We advise you on your personal presentation, looking at what shapes work best with your architecture and which styles best reflect your personality. If you’re unsure on what styles that you should wear (and which to avoid), we can help. Please get in touch here to find out more about our services.